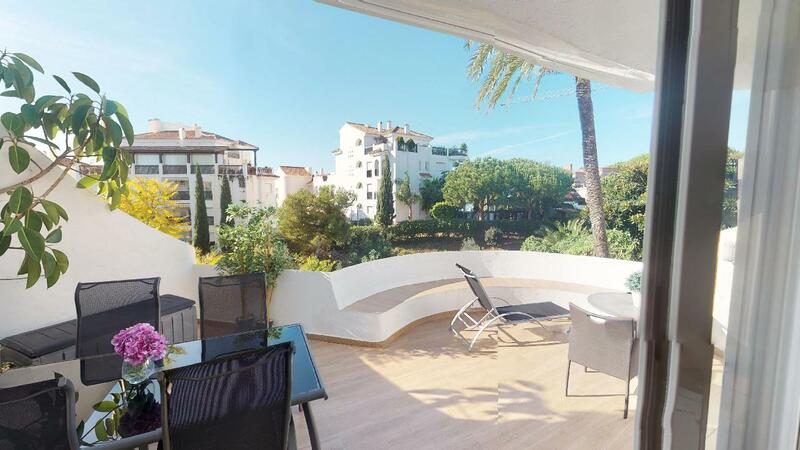 Immaculate penthouse located beach side in Calahonda. This property is located in a well established complex with tropical gardens and a stones throw away from the beach promenade of Calahonda. The property was totally reformed in 2012 to bring it up to a modern and luxurious standard. The living area is spread over the two upper floors of the complex and consists of; first floor; entry hall, bedroom, bathroom, large lounge with a open plan Danish designer kitchen, a large south-west facing terrace with views to the tropical garden and pool. When you walk up the stairs you enter a balcony landing which is open over the two floors, upstairs is the second bedroom (currently used as a walk-in wardrobe) and the master bedroom. The master bedroom has a private south facing terrace with partial sea views and a big en-suite bathroom with both a walk-in shower and a bathtub. The whole second floor has high vaulted ceilings which gives it an airy feel. The apartment has high quality ceramic floors with Swedish underfloor heating throughout as well as hot and cold A/C from Panasonic. To ensure maximum energy efficiency the incorporated spotlights are all 3W led and all windows are double glazed with thermal break frames. All windows have mosquito screens and the terrace has a modern white motorized awning. The kitchen is fully equipped with appliances and worktops from Silestone. The Calahonda beach promenade and the beach are located only 130 metres from the door and there are several great beach restaurants only a few minutes walk along the board-walk. Other restaurants and amenities such as supermarkets, bakery, hairdressers, pharmacy, gym and more are located only 400 metres away. The famous Cabopino Marina is less than a 2 km walk along the beach. Very comfortable modern living close to everything.